The Concrete Neck Mike Tyson in the ring may be fierce boxing. Undaunted he was confronted by anyone. However, in the Prophet's Mosque, he bowed, tears flowed. This is the spiritual experience of former world heavyweight boxing champion Mike Tyson when conducting worship Umrah, a few days ago. Tyson stepped on the Holy Land for the first time on Friday, July 2, 2010. While in Medina, he met with Dr. Muhammad Al-Uqala, Rector of Islamic University, who explained to him about what facilities are provided to university students from around the world. His visit to Saudi Arabia is governed by the Canadian Association of Da'wah (CDA), CDA is a lot of proselytizing agency sponsoring the new Muslim celebrities for a visit to Saudi Arabia to carry out the pillars of Islam. Tyson The trip was arranged by the Canadian Dawa Association (CDA), the Canadian Association of Da'wah in the usual travel arrangements reverts celebrities visiting the historic sites of Islam in Saudi Arabia. Shazad Mohammed, President of CDA, to participate in welcoming the arrival of Tyson Prince Muhammad International Airport, Medina. Shazad Mohammed, who is also a UN peace envoy, said that Tyson would be in Saudi Arabia for one week. He will visit holy places and other important places in the kingdom, and met with the Saudis to better identify the local culture and traditions. Boxers are often knocked his opponent was immediately conducted a number of activities, including conducting worship in the Masjid Nabawi. Saudi Gazette reported that Tyson was staying at a hotel near the Prophet's Mosque and the extraordinary acclaim from fans. It gets tight guard during midday prayers. 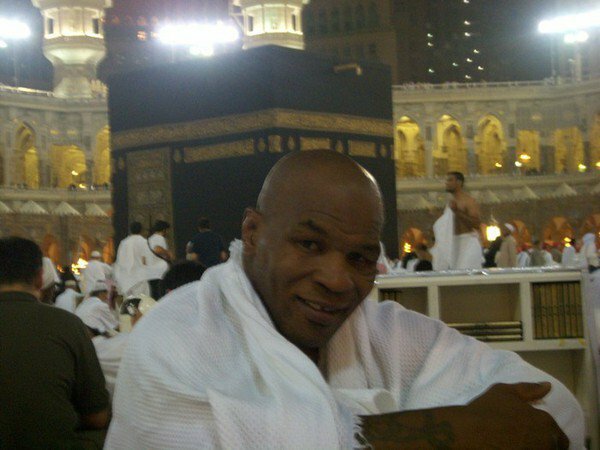 Tyson claimed to have extraordinary spiritual experience during the Umrah in Saudi Arabia. "I am happy to have fans who love me in Saudi Arabia. But, I hope they leave me alone to enjoy a spiritual moment in the Holy Land. I am not authorized to tears when I found out that I was in one of the gardens of paradise, "Tyson said when visiting the Prophet's Mosque. From Medina, Tyson plans to continue the journey to Mecca to perform Umrah. After doing the pilgrimage in Mecca, former world boxing champion is planning to visit Jeddah, Abha and Riyadh. Tyson whose full name Michael Gerard Tyson was born in New York City, USA, June 30, 1966. 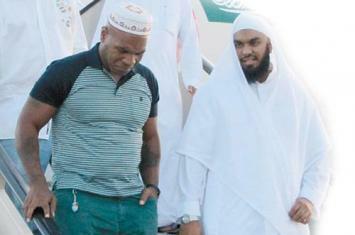 Tyson converted to Islam while still in prison in mid-1990. Officially, in 1995, post-prison in Indiana, Tyson announced the move to Islam who had learned while in the prison, with a new name Malik Abdul Aziz.